Book Description: The Babylonian Talmud is often cited as the bedrock upon which Judaism stands. And yet, it remains a closed book for the majority of Jews. Since the Talmud's composition does not follow the rules of Western writing, beginning learners are often thwarted in their first attempts to "swim in the sea of Talmud." These modern learners often experience rabbinic literature as a sort of stream-of-consciousness writing that seems to wobble off-track quite frequently. Frustrated, these learners often give up. To understand the Babylonian Talmud (also called the Bavli) readers need to understand its process of composition and the fundamental differences between Western and rabbinic writing styles. 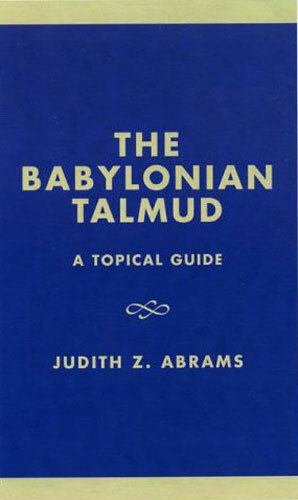 Judith Abrams's The Babylonian Talmud: A Topical Guide is a teaching tool and a reference book for those who teach and learn Talmud. It explains the Babylonian Talmud's literary nature and metaphorical meanings.